A slowdown in China's growth has led to a cut in the World Bank's growth forecast for the East Asia region. NEW YORK (CNNMoney) -- The World Bank said a slowdown in China will drag on growth in the entire East Asia-Pacific region. The bank, an international organization that helps to fund projects in the developing world, said in a report released Wednesday that growth in the East Asia-Pacific region should slow to 7.6% this year from 8.2% in 2011 and 10% as recently as 2010. The slowing regional growth is due to China, which has seen its exports fall due to economic weakness across the developed nations that are its primary customers. Chinese growth is projected to fall to 8.2% this year from 9.2% last year, according to the World Bank's forecast. The bank said China and other developing economies in the region need to do more to break their reliance on exports, such as encouraging domestic purchases. Excluding China, growth is expected to be 5.2% this year, helped by a return to normal production in Thailand, which was hit by devastating floods last year. That would be up from growth of 4.3% excluding China in 2011. Those growth rates are all much stronger than in developed economies elsewhere in the world. The U.S. economy grew only 1.7% in 2011, and had a 2.2% annual growth rate in the first quarter of this year. The ongoing sovereign debt problems in Europe resulted in essentially no growth in the European Union and eurozone in the first quarter of this year as the continent teetered on the brink of a recession. There were 11 countries in Europe that have suffered a drop in their gross domestic product for two quarters or more, the common definition of a recession. 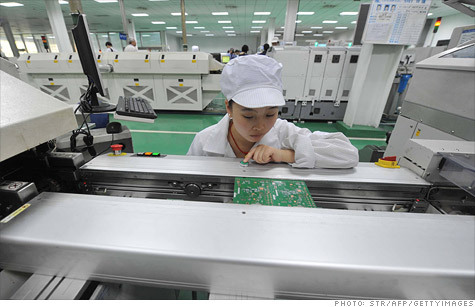 The drop in demand for its exports has caused China's manufacturing to slow in recent months. And the slowing in China has prompted the People's Bank of China, the nation's central bank, to take steps to stimulate the economy. But there are still worries that the slowdown in China could represent a so-called "hard landing" which could hit the global economic recovery.